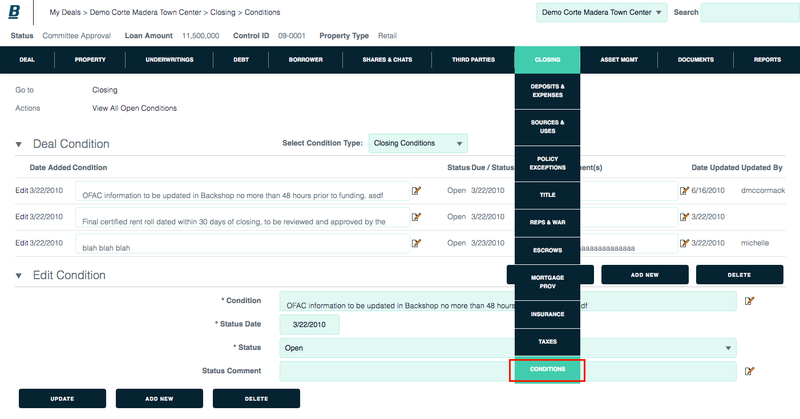 Backshop lets you set up and track closing, post-closing and rate lock conditions for all of your deals. Click Closing tab and Conditions sub-link. 1. Select condition type — closing, post-closing or rate lock — in menu. 2. Click Add New link. 1. Enter description of condition, status date and status comment. 2. Click Update to save. 1. Select condition type in menu. 4. Click Update to save.